It's not all about numbers but no one could argue that measurements of weekly mass attendance are not, despite their limitations, of some value in assessing the state of the Catholic faith among the Irish people. The Iona Institute has just released details of an opinion poll conducted on its behalf by Red C. Red C is the company which conducts the monthly Sunday Business Post political poll. The new poll is best read as one in a series over the last number of years. The goal of this update is to provide a one-stop-shop for those polls. Towards the end of the nineties into the early years of the new millennium, the decline continued at the rate of about 2% per year. [From 60% in 1998 to 50% in 2003]. Since 2003 the rate of decline appears to have slowed to about 1% per year. [From 50% in 2003 to 45% in 2008]. Warning:: One must readily concede that these polls are of limited comparative value for several reasons- different interview methodologies; some companies poll 15-18 year olds, others poll only 18+; some figures refer explicitly to mass attendance among the Catholic sample whilst other refer to mass attendance in the general population, whilst others refer to general church attendance in the general population. All of these can influence results by a point or two when contrasted with other polls. Thus trends over a good spread of years is about as much from which one can draw conclusions. Digest of Church Attendance Polls since 1972. (source: A Survey of Religious Practice, Attitudes and Beliefs in the Republic of Ireland 1973-1974, Research and Development Unit, Catholic Communications Institute of Ireland, 1975). 2.6% said they "never attend". 3.4% said they attended more than once per month. (source:Religious Practices and Attitudes in Ireland 1988-1989, Micheal Mac Greil, Survey and Research Unit, St Patrick's College, Maynooth, 1989.) A further 5.6% claimed to attend more than once per month and 2.5% reported "never". (source:The Sunday Tribune/IMS: 1100 people interviewed at 100 locations, age 15+, face to face on 11th April 2005 (3 days after the funeral of Pope JP2). 7% never attend, 12% once per month or more. (source: ESRI in The Challenge of Indifference, Micheal Mac Greil, 1000 18+ face to face interviews, Nov. 07 - Mar. 08, published 2009). (source: Irish Examiner/Red C; telephone interview of 1005 people, 18+). 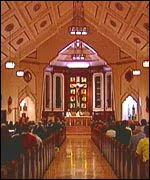 Figures refer to attendance at mass, church or other services. 13% never, 11% monthly. (source: Iona Institue/Red C; telephone interview of 1000 people, 18+). The question is slightly different to other polls. In this case, people were asked "When was the last time you attended a religious service in a place of worship?" as opposed to the more typical "How regularly do you attend a religious service?"